It was an awesome summer this year! Oh yes, and we did deserve it! We had to forget how long the winter stayed on last season and hope it wouldn’t return so soon. Temperatures soared up to 37° C at average will want to make you lie by the riverside or lake sparsely clothed all day long. But not all summer. Too boring for me. 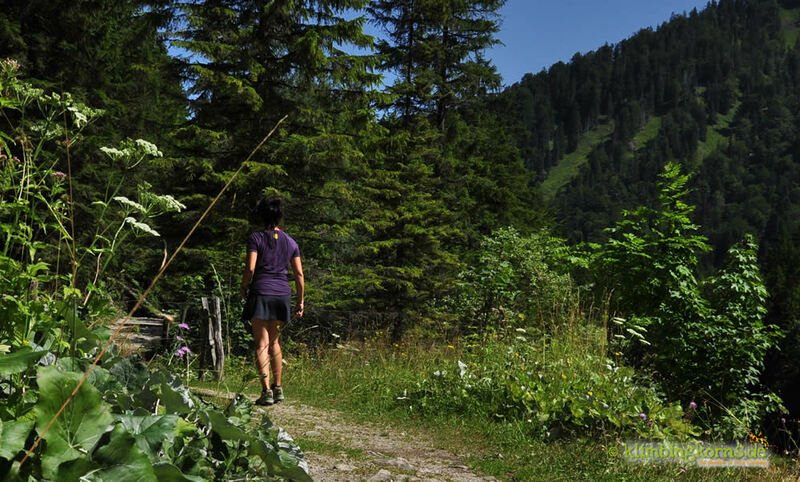 And for some, they are crazy enough to make a quickie and run up the mountain on such days. One of them was me. 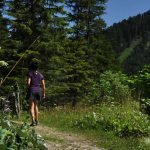 Equipped with an ultra light day pack, some water and technical wear consisting of my new merino Run Swift Skort ,Sprite Racerback Bra and GT 150 Ultralight Bolt SS Crewe from Icebreaker I was ready to venture the trial I have done often, but never with a summit. This summer marks the change of the history when summits starts to make a new meaning to me. I have worn many merino garments on cooler days, but never on a hot summer day. Eager to find out if I would feel comfortable in the scorching heat, I set out with my new sheepy garments. 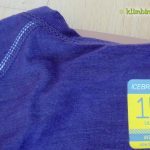 Icebreakers no stink slogan makes it even more comfortable to know that you won’t have to worry about feeling uncomfortable while socializing after sweating out the whole day with the same garment. 5 Is this really good for summer? Or something for cooler days? Merino wool is so soft, it doesn’t itch. Maybe for the ultra sensitive skin, It may feel a wee bit scratchy in the beginning, but believe me, after the first wash, the garment is absolutely soft and comfortable on your skin. Really. But wearing wool in summer? Wool insulates you from the cold coming in, and keeps the heat out. It will regulate your temperature during high activity. Since the material transports moisture away from the body, it allows interaction between the air and moisture making you feel far more comfortable than when you are wearing a cotton tshirt. Your cotton will hang like a wet damp rag on you. Not with Merino products. They stay in shape, they don’t sag, they don’t itch when wet and they don’t let you freeze while this interaction takes place. Icebreaker’s highest technical line are found in their GT models. 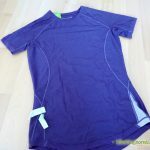 They are technical wear where it is especially thin in areas where the athlete normally sweats most. A 3% Lycra mix ensures the garment stays in shape, is stretchy and active movement flows like how you want it to without inhibiting. Isn’t that embarrassing? All you did was sweat and now you wouldn’t know where to hide yourself on the dining table. Sweat itself does not smell. But when sweat reaches the surface of the skin, bacteria and hormones will start breaking it down, thus making the moisture stink. To test the difference, I brought two kinds of garments along. 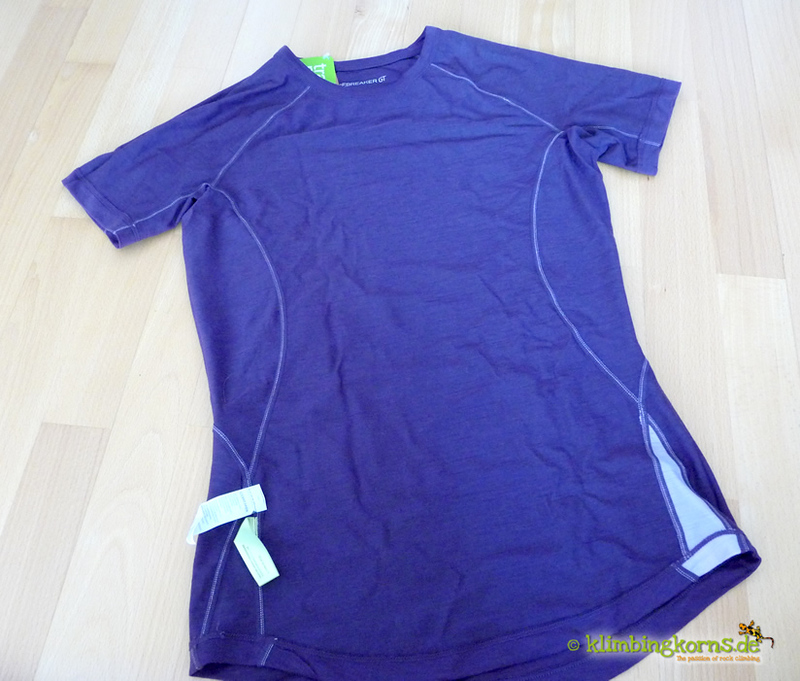 One tank was a cool top for running athletes, made of 93% Polyester 7% Lycra, the other was Icebreakers GT 150 ultra light Shirt, with 97% Merino and 3% Lycra. The Polyester Tanktop absorbed all moisture from the body and kept cool, as promised in the tag. However, at the end of the day, I had to change the top as the odor was so strong, it was more than embarrassing. 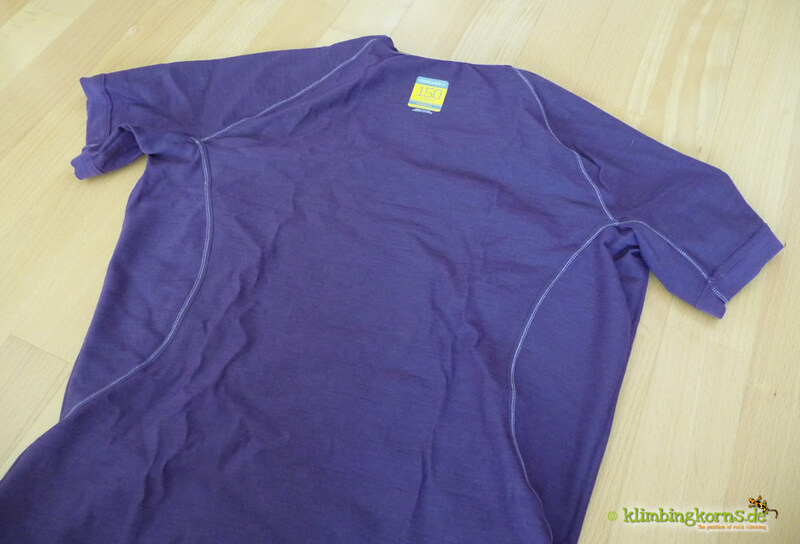 The next day, I wore the merino product. The temperatures got a little higher, as we descended to lower altitudes from the summit. 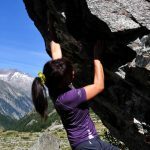 Nevertheless I felt comfortable, and even though the back was wet from the sweat, I did not feel that I have to immediately jump into a new top when we reached our goal. It wasn’t possible to wear the polyester t-shirt again the next day. Somehow, it didn’t dry up even while it was hanging out to dry the whole night. And the odor was still there. I imagined by now how the millions of bacteria were feasting on my sweat. I was so surprised that odor sets in so quickly with polyester. On the other hand, the Merino shirt dried up in a jiff and it was pleasant to slip in it again. it’s natural antibacterial qualities in the wool keeps your odor down even after a couple of days perspiring profusely in it. Oh yes, say good-bye to shrinking woolen garments in your closet. You can now wash them at 40°C. Wow. I wonder why it took them so long to discover using Merino wool. Nevertheless, every athlete in alpine conditions should always try to stay dry in their garments. It doesn’t mean you can drench your garment in water, wear it and expect yourself to feel wonderful. 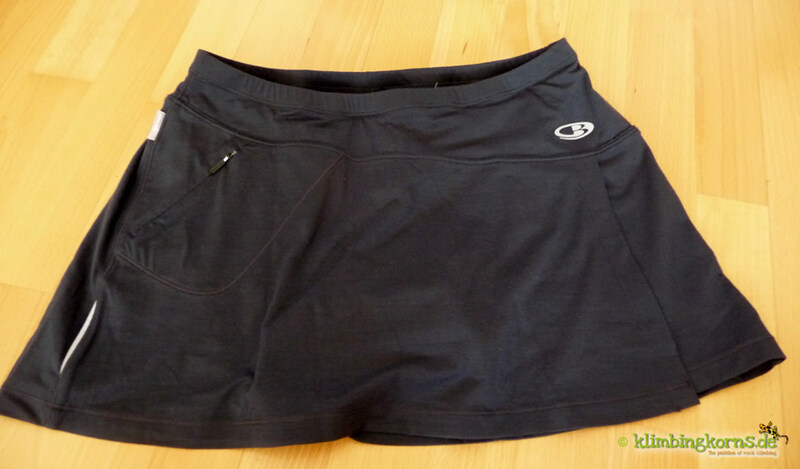 The Icebreaker Run Swift Skort is a comfortable runners pant with a skirt lining around it. Those of you who shy wearing an ultra short tight hugging leggings, can now turn to a feminine tight shorts solution with a skirt around it. The pant is comfortable on the inside with its 100% inverted flatlocked seams. Theres no chance for you to feel where the notch is. The A-cut design has a high slit in the front for maximum movement while running. So even if you are going to put in a few splits or hand stands in your run, you won’t feel inhibited. Theres a little zip up pocket in the front big enough to keep your car keys in it or a credit card. The material is a mixture of 200g/m2 merino wool and Lycra. 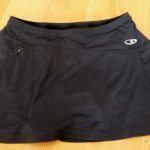 The length of the Skort is short enough to allow hot vapours to escape from the body, but still enough to cover anything you might want to hide under it. The Sprite Racerback Bra has 96% Merino wool and 4% Lycra for a good fit. It keeps everything in place, supports well without inhibiting any movements. 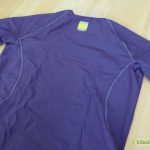 The colour was a very attractive and sporty Azalea / Mimosa that comes with a Racerback design. The Icebreaker GT 150 Ultralight Bolt SS Crewe is the lightest from its GT series and is designed for high performance activities in summer and warmer days. It has a Raglan cut, and flatlocked seams. The eggplant colour was lovely for any lady. Is this really good for summer? Or something for cooler days? It was an amazing experience to compare wearing a man-made synthetic and a natural product. Designed to be so much lighter and more technical, you can count on the garments from Icebreaker to keep you warm and somewhat comfortable even when drenched in your own sweat. And it’s all natural! There is one fact you should bear in mind. Products with Merino wool does not stop you from sweating! You will still pespire while carrying out with high performance activities, but you will also “feel” drier when you have merino wool on. 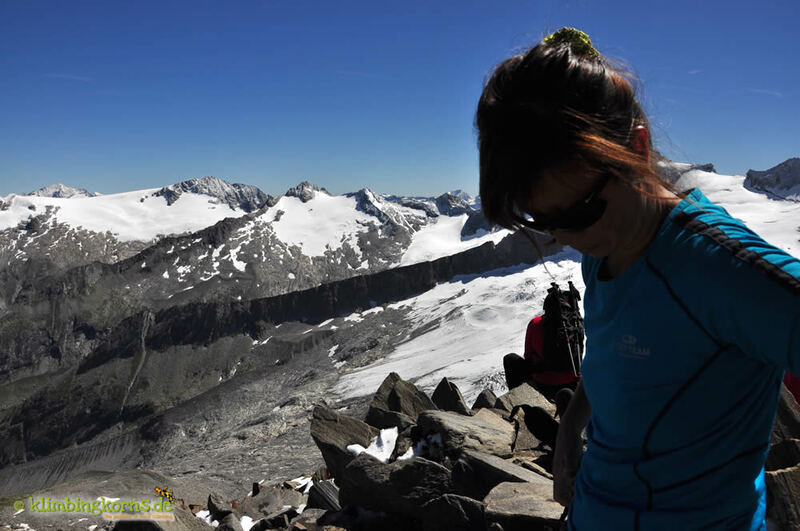 The Skort accompanied me to one of my 3000m summits and even felt comfortable as a pyjama short at night. 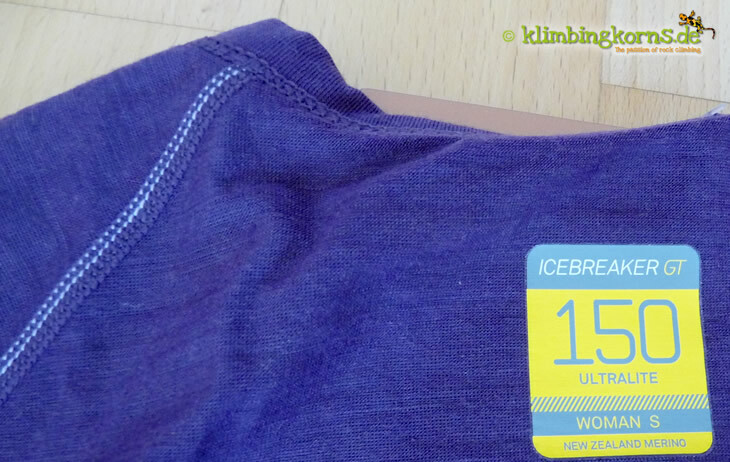 With Icebreakers flat seams inverted, you feel like a baby when you have these garments on. There’s no itching, no seam that twitch or scratch, no stinking even after a few days of continual wear. Lighter material on spots where you sweat most makes the GT Crewe shirt a real technical wear. I am a person who sweats profusely. I perform best between 0°C to max. 10°C on trials, hikes and cross-country skiing. Anything else above that would make me melt. I wouldn’t say that the GT 150 Ultralight Shirt at 35°C was not appropriate, but the Crewe cutting made me feel too covered. A tank with a bigger neck cutting would have been the better choice for me on such hot days. Then again, it was really crazy to start any activity at such high humid temperatures. At 22°C, the Shirt felt definitely much more in place. Prices for these garments are generally pretty high. But paying for something natural and something that works is worth its money. Morever, if I knew that the company takes animal welfare in their production seriously, I am well prepared to pay the price. I would definately say yes to wool in summer. And yes to Icebreaker! You guys did a great job. Thank you! 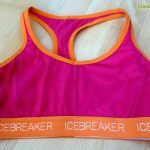 Icebreaker is a company in New Zealand who builds their product to meet strict standards on environmental management, animal welfare and wool quality. Since 2008, you can trace the product you bought from the history of the wool to the supply chain, with the Baacode online. According to Jeremy Moon, CEO and Founder of Icebreaker, their goal is the challenge to build the cleanest clothing company on the planet. Their slogan “It’s about our relationship with nature, and with each other”. 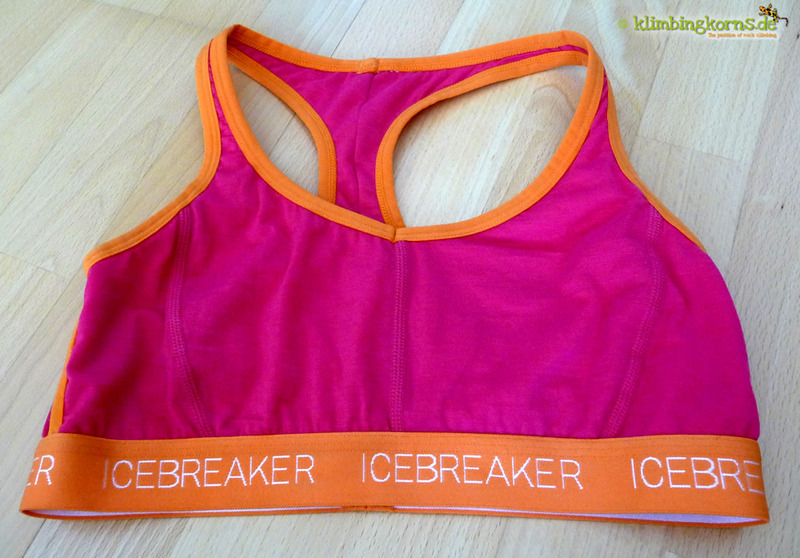 Hier ist er ja, der Skort von Icebreaker!